We’ll come back to it shortly. Times change, we all know that. But no matter what it is that changes, we adapt and we carry on (eventually). The internet isn’t going to take away everyone’s jobs and it won’t actually be the death of the high street. New jobs will still be created; after all, who is going to teach our robot overlords empathy? And the high street will evolve into something different to what it is now. The key here is change, that’s why we built the me:now app – to promote a fundamental change. Small businesses need to change how they advertise; not just because of GDPR, but because customers are starting to see the impact of both traditional and “new” advertising. When a locksmith has to pay a local directory £800+ a month to be the number one locksmith in his area, we as customers shouldn’t really be surprised that locksmiths are expensive. The same goes for “services” that offer to find the right business for you. If an advertising “service” also charges the businesses a 20% “management fee”, is it any wonder we wince when we get the final bill? When there’s a huge fee for advertising, then just one person ultimately pays the price: the customer. This is what we believe: businesses can stand out by letting people know when they are available. This is especially true for small businesses. What’s the point of having the best physiotherapist in the area, if they can’t fit you in? The best of any industry suffers from cancellations or diary gaps (especially the service industry) but these diary gaps are often only promoted by calling people on a waiting list. It’s not a negative to have a gap in the diary, it’s an opportunity for someone else to fill it. But, small businesses need to meet customers halfway and tell them about it. 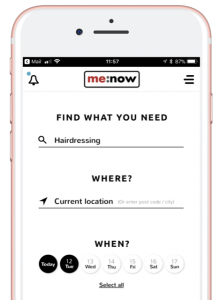 The me:now app is a quick and simple way of publishing these diary gaps. It also alerts a loyal customer base to the fact that a business can fit them in. There are 24 chairs in the image above. If each chair was a customer on a waiting list, it could take in excess of 30 minutes to call them all and there is no guarantee that the appointment could be filled. When customers follow a business on the me:now app, they choose to receive a notification about that business’ availability. If five of those chairs were customers following a business on the me:now app, it could take as little as six seconds to contact them. In fact, even if it was all 24, it would still take just six seconds to contact all of them. The app sends a notification directly to the mobile device of customers who want to be alerted when an appointment is available. Simple really. The average hourly appointment in the UK brings in £60 of revenue. There are approximately 48 hourly appointments in a six-day working week (that’s 192 a month). If you have two staff, then you can obviously double that. As a small business owner, you should ask yourself, am I making £11,500 a month per member of staff? The free tier of the me:now is a taster. Try it five times and see if it works for as long as you like. If your business were to fill five extra appointments a month for a year, then you have made (on average) £3,600 more. Nice! You only need to tell your customers to follow you on the app. And the actual cost to you? Nothing! The premium tier promotes 30 appointments a month. It costs just £35 a month. And if you fill all 30 of those, over the course of a year you’re up £21,600. My chiropractor earns double that and she is one of nine doctors in her practice. For them, that’s potentially a staggering £388k more per year. I think the next time we’re asked: What does me:now do? Who is it for? What is the benefit? I’ll just show them this blog.